Synonyms: Aglaia acida, Aglaia diffusa, Aglaia latifolia, Aglaia minahassae, Aglaia sulingi. Other names: balik-balik, changkru, curran kaniue, dieng soh-longar, kaniue, khangkhao, kholaen, khrang, langsat lotung, malasaging, momailateku, sinakedang. Leaflets 7(-11), alternate to subopposite; petiolules 3-11 mm, slightly inflated; leaflet blades ovate-oblong to elliptic, 5-10(-22) × 1.5-4(-11) cm, papery, both surfaces glabrous but abaxially sparsely lepidote along midvein, midvein abaxially prominent and adaxially conspicuously depressed, secondary veins 9-12 on each side of midvein and abaxially prominent, base rounded to cuneate, apex acute to acuminate. Thyrses axillary, 5-15 cm, sparsely branching, brown squamate. Flowers subsessile, globose, ca. 2 mm in diam. Calyx 5-lobed; lobes rounded, sparsely brown squamate, margin ciliate. Petals 5, broadly ovate, glabrous. Staminal tube globose, free from petals, glabrous, apical margin entire or undulate; anthers 5, ovoid, inserted on or near throat of tube, included or ± exserted. Style very short; stigma conical, truncate, glabrous. The edible part of a langsatan fruit are the pulp and the aril. 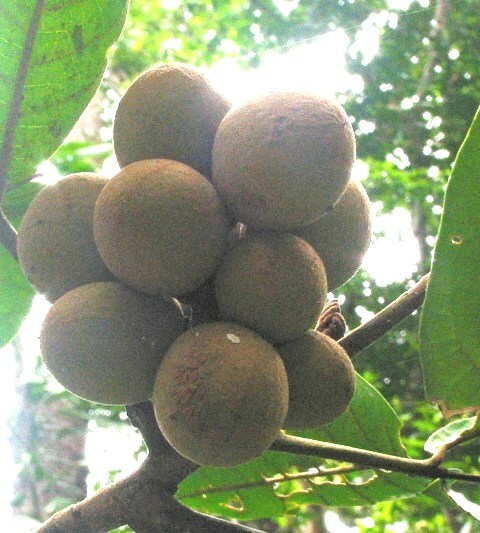 The fruits, which resemble langsat in taste and size, are fondly eaten. Wood is hard and durable. It is used as timber. Langsatan is not cultivated anywhere.